Last week we posted about our brother Luis Lopez, who we met through one of our members who is a nurse where he receives treatments for Sarcoma, a type of cancer. Luis, who is only 20 years old and came to this country just last year after his father was murdered in his native Honduras, was baptized several months ago by Carlos Ingles, our bilingual minister. Luis recently received the tragic news that his doctors do not expect him to recover from his cancer. 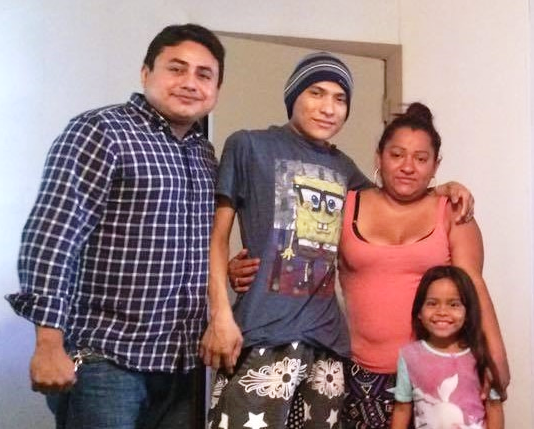 Carlos last week began a push to raise funds to help Luis go back home to Honduras so he could spend his remaining days with his family. Both Carlos and Luis have been very grateful and humbled by the overwhelming response they have received, both by our members here at Impact and by people who have heard about Luis’ plight on Facebook or elsewhere. Carlos reports that they have raised enough money to send him home, although any additional funds would be appreciated as they would go to helping him have higher quality care in his last days than he would have otherwise. We were blessed to have Luis at services at Impact on Sunday; with some effort he came with his brother, sister and niece. We were able to have a wonderful time encouraging him, loving him, and laying hands on him. His sister Escarlet and 5-year-old niece arrived on Saturday from Honduras after a month-long journey; they came to look after him only to arrive here to hear this sad news. We were able to help her with food and clothes from our Distribution Center after their harrowing journey, and afterwards they took this picture. We are now waiting for a document called “safe conduct” from the Honduran Embassy here in Houston so that Luis can travel home. We are so grateful to everyone for your generosity; it is amazing and encouraging to see so many moved to help when one of our brothers goes through something like this, especially those who have never met Luis. Thank you very much for your ongoing prayers for him and God bless.